This is a 12″ to 40″ tall, erect, perennial forb that rises from a rhizome. It often forms colonies. The stems are erect, square, hollow, and usually unbranched. They have copious hairs both on the ridges of the stem and between the ridges. The hairs are bent downward. The hairs on the ridges are distinctly longer but not much stouter than those between the ridges. The leaves are opposite, lance egg-shaped or broadly oblong to egg-shaped, 1⅜″ to 3½″ long, and mostly ¾″ to 1½″ wide. They are mostly stalkless but some may be on short leaf stalks. The leaf blades taper to a point at the tip and are broadly rounded or almost heart-shaped at the base. The upper surface is green and hairy. The lower surface is paler green and has hairs along the major veins. The margins have rounded, forward-pointing teeth. The inflorescence is a cluster of usually 6 flowers. Lower clusters rise from the upper leaf axils. Middle and upper clusters are opposite and are subtended by a small, leaf-like bract. Each pair of opposite flower clusters together form a false whorl. 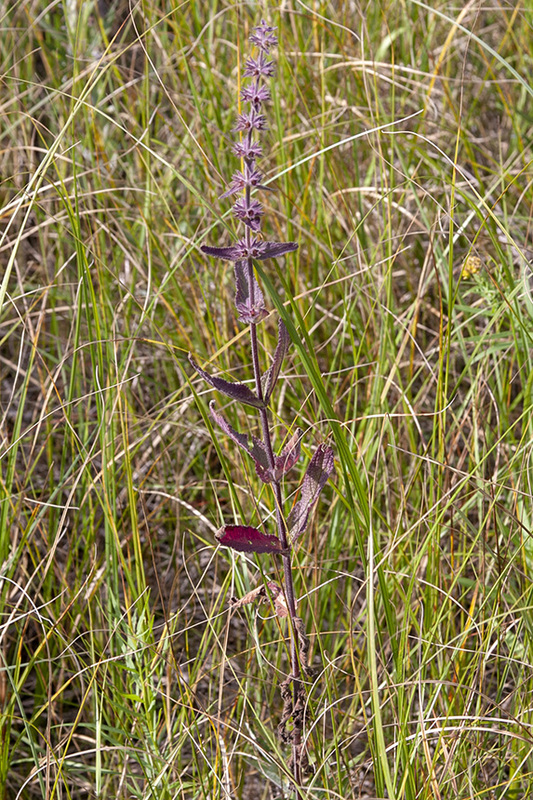 The bracts become gradually smaller as they ascend the stem. The flowers are 7 ⁄16″ to ⅝″ long. 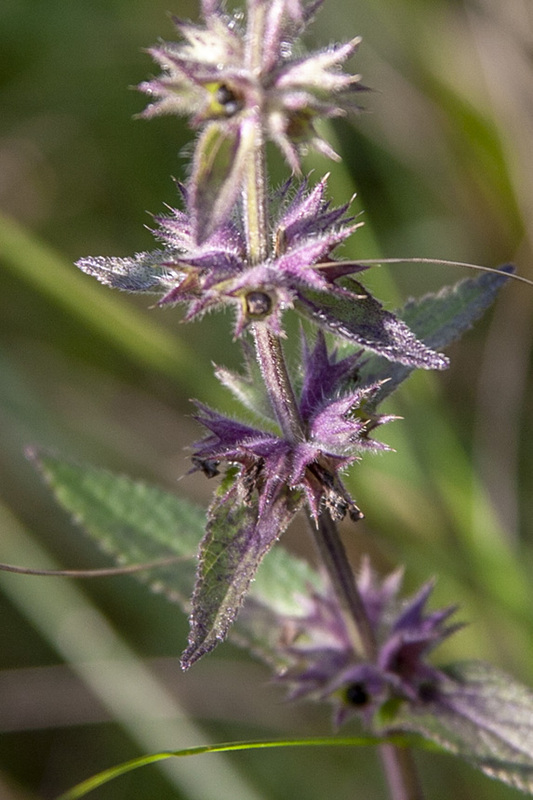 They have 5 green or purplish, hairy sepals that are fused at the base into a calyx tube ¼″ to ⅜″ long and separated at the end into 5 lance-shaped lobes. The calyx lobes are nearly as long as the calyx tube and are hairy. 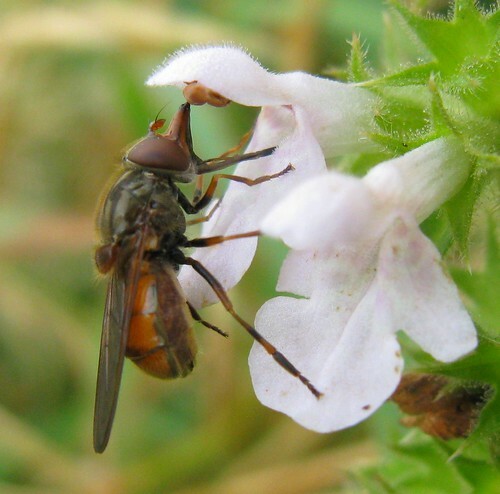 There are 5 petals that are fused at the base into a corolla tube about ¼″ long. The petals are pink or lavender with white spots. The calyx tube is always at least ⅔ as long as the corolla tube. The corolla is divided at the end into 2 lips. The upper lip is about 3 ⁄16″ long and ⅛″ wide, hood-like, hairy outside, hairless inside. The lower lip is divided at the tip into 3 lobes, a large central lobe and 2 smaller lateral lobes. There are 4 stamens protected beneath the hood. The fruit is 4 greenish-white, 3-ribbed, 1-seeded nutlets. They turn black when they ripen. American germander (Teucrium canadense) flowers have a greatly reduced upper lip. Hairy hedge nettle (Stachys hispida) stems have hairs on the ridges but no hairs between the ridges. 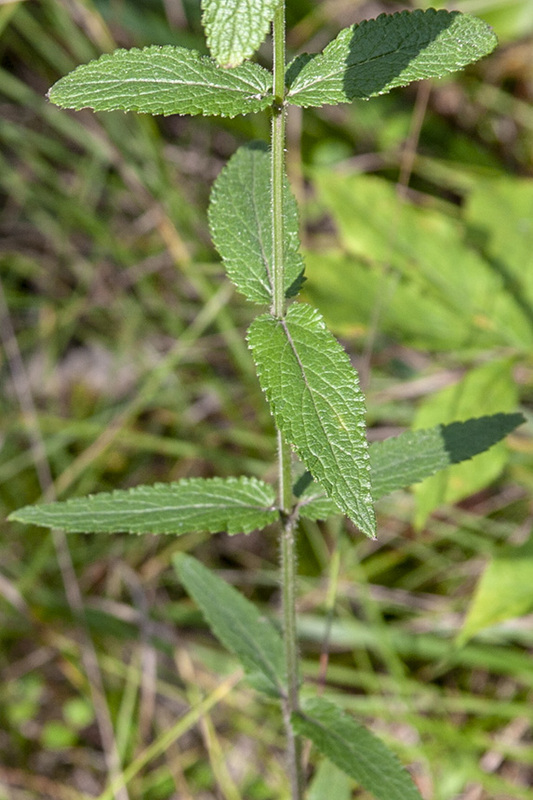 Smooth hedge nettle (Stachys tenuifolia) stems have hairs on the ridges but no hairs between the ridges. The leaves may have hairs along the midribs but are otherwise hairless. Woundwort (Stachys pilosa var. arenicola) stems have hairs on the ridges and between the ridges that are about alike. 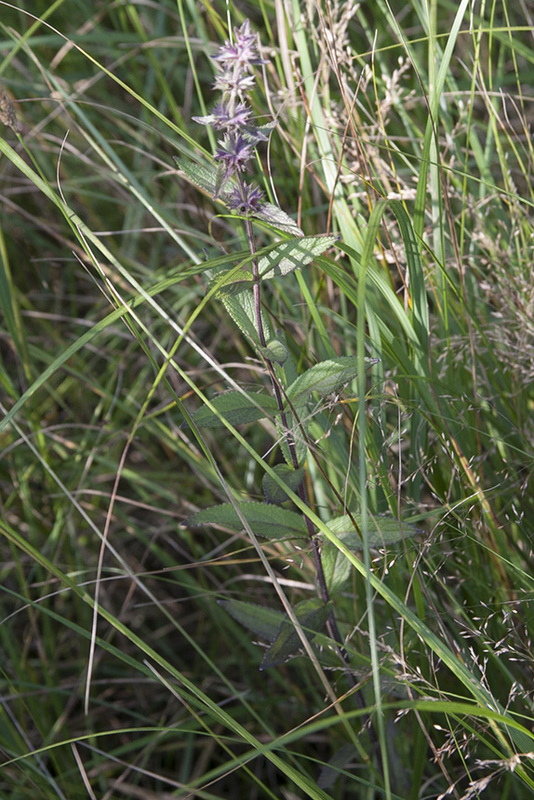 The leaves are narrower, rarely wider than ¾″. There is much disagreement about the classification of Stachys species. The classification used on MinnesotaSeasons.com follows ITIS37 and The Plant List36. It does not match either GRIN38 or the Minnesota DNR (MNTaxa28). Van dichtbij een bloem waarvan het bijna exotische doet denken aan orchideeën. Langs onze sloten en op andere vochtige gronden is zij heel algemeen.